I get a lot of emails with questions about pregnancy nutrition, even more so now that I’m pregnant myself. 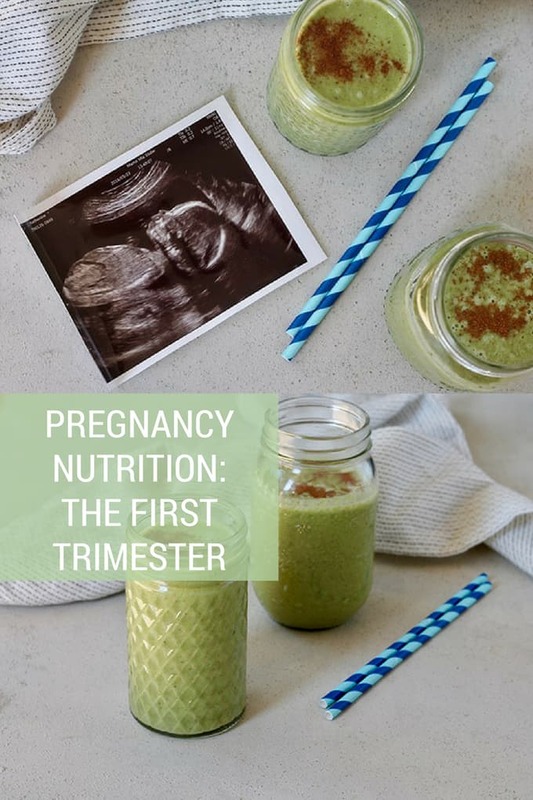 So I thought this might be a good time to look back to the beginning and talk about pregnancy nutrition in the first trimester. I think it’s important to note that I am in no way an expert on pregnancy, nor am I a physician or a clinical dietitian. 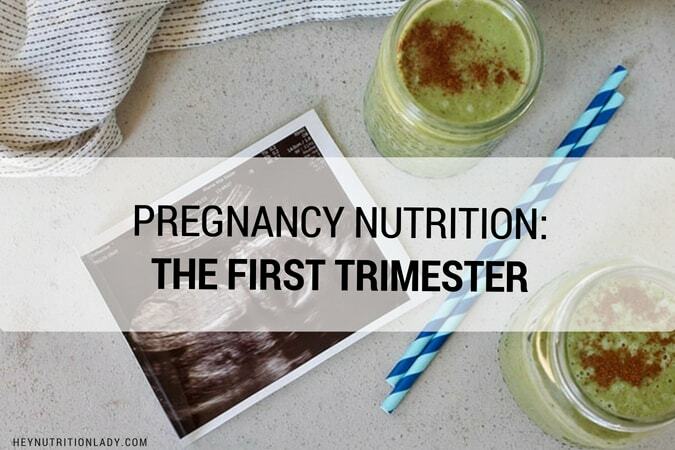 So the information I’m sharing on pregnancy nutrition comes from a combination of information I’ve gleaned over the course of two degrees in nutrition (BSc and MSc), further reading, and my experiences with two pregnancies. Please be sure to speak to your health care professional if you have any specific concerns. In general, I flip flop a lot between these two thoughts: “how did anyone manage a pregnancy without the internet?” and, “ugh, so much internet.” Seriously. There’s so much information. So many comparisons. And it can be soooooo overwhelming. Here is the most important thing I’ve learned so far: your pregnancy is YOUR pregnancy. The way you feel, the energy you may or may not have, and the foods you may or may not be able to eat, that’s yours and yours alone. So let’s just hold up right now and stop comparing ourselves with our friend / cousin / sister who ate kale salads and ran marathons in the first trimester. Just because you’re wrapped around the toilet bowl at the slightest whiff of lettuce doesn’t mean that they get an A+ in pregnancy and you don’t. Pregnancy hormones are no joke. And whooooeeeee, do you ever learn that quickly in the first trimester, especially if you’re having a rough go of it. Here’s the thing. You won’t do yourself any favours by beating yourself up about what you are or are not able to eat. You have to give in to the first trimester and just roll with what works. The bad news is that you may feel like crap. The good news is that it’ll probably be over soon enough, so do what you gotta do to get through it. In approximately 60% of women, the nausea subsides by the end of the first trimester (12-13 weeks), and only 9% of women experience it beyond 20 weeks. If you’re one of the unlucky few who experiences nausea beyond that point: I’m sorry. But the good news is that your body is a highly sophisticated baby-growing machine, and it will make sure that your little tadpole is getting exactly what it needs, even if your diet consists entirely of boxed macaroni and cheese. Just make sure you knock off the booze, stay hydrated, and start on a good prenatal vitamin if you aren’t taking one already. One of the best things you can to do avoid nausea and vomiting is try and pinpoint the things that are causing it in the first place. Is it certain odours? Allowing yourself to get too hungry? Certain foods? Certain movements? Time of day? All of the above? When nausea is at its worst, many women (myself included) find that eating a lot of small meals helps to keep the nausea at bay. This make sense, because eating small amounts frequently can help prevent you getting too hungry (or too full, which is another nausea trigger) and helps to keep your blood sugar stable. I found that having breakfast ready to go pretty much the moment I opened my eyes was super helpful (overnight oats were essential! ), plus a having a bunch of easily grabbed snacks on the ready. Also, I found wearing acupressure wrist bands to be pretty helpful. They’re not super comfortable at first, but you get used to them pretty quickly. I wore mine anytime I was awake until about week 12. Although I consider myself one of the lucky ones when it comes to morning sickness, I had terrible, horrible food aversions that hit at around the 7-week mark both times, that still haven’t entirely left me. And it happened overnight. On the first round, I made a huge batch of a roasted corn and bean salad from one of my favourite food bloggers, which was delicious to me on Monday, and on Tuesday morning the sight of it made me feel so physically ill that I had to throw it all away, container and all. I still can’t really look at a photo of that dish without feeling queasy. This time around it was grilled cheese and kimchi sandwiches, which I was on a bit of a bender with but now can’t really even think about if I don’t want to feel sick. So what’s with that anyways? No one really knows why we get food aversions during pregnancy, but one totally plausible explanation is that it’s a leftover protective mechanism from our pre-refrigeration days. This makes sense if you think about it – the foods we tend to shy away from are things like vegetables and meats, which would have been more likely to spoil, and we reach for ‘safer’ foods like plain crackers, pasta, and crackers. Sure thing, but keep in mind that one of you is the size of a peanut. The general rule is that in the first trimester you get an extra 50 calories a day. That’s half a banana, or a medium apple, to put things into perspective. So don’t go using your pregnancy as an excuse to hit the all-you-can-eat buffet, but for Pete’s sake, if you’re hungry, eat! On the flip side, if you’re so nauseous you’re having a hard time eating even a normal amount of food for you, never mind worrying about 50 extra calories. Eat what you can, when you can, and look for ways to sneak in extra calories – like switching to full-fat dairy products or eating fistfuls of nuts if that’s something you can stomach. One of the things I opted for this time around is a Date Almond Smoothie, which tastes kinda like a milkshake, but contains a good amount of protein and healthy fats thanks to almond butter, and a dose of hidden vegetables. Do you find yourself reaching for carbs, carbs, and more carbs? That’s super common. In most people I talk to they either end up focusing pretty hard on the bread group (that’s me) or the fruit group. These are both easily digestible sources of fast-absorbing carbohydrates (sugars), which allow your body to absorb some energy before it all comes up. Try balancing those carbs out with some protein or fat if you can stomach it, such as full-fat yoghurt, scrambled eggs, a slice of cheese, nuts or nut butter, or avocado. This will help keep your blood sugar stable, and will help you feel better in the long run. The bottom line is, eat as well as you can. And I mean, eat as well as YOU can. No comparisons, no guilt, no beating yourself up over anything. This phase will pass, and you can make up for it in the 2nd trimester when you’re feeling better. More on that soon! Originally published November 3, 2015. The internet can be such a great resource, but also a vast wasteland of fear mongering information. It’s hard to find the balance! But at the end of the day, we’re all just doing our best, right? Congrats on your pregnancy!